One of the most popular sitcoms of the 1990s was NBC’s Friends. Ever since the series ended its 10 year run in 2004, there have been rumors of plans for a reunion of some kind. Some of the castmembers have said that they would be open to a reunion if it was handled well. Apparently David Schwimmer isn’t one of them. Though Schwimmer has no interest in hanging out in Central Perk again, he is grateful for the sitcom. “I’m often asked whether Friends has been an albatross around my neck, or whether people only see me as ‘Ross from Friends,’ but I don’t ever think negatively about it. Really, that show has been a blessing. It’s given me the financial freedom to choose the projects I really want to do.” It seems that doesn’t include reuniting with his Friends any time soon. Stay tuned! Friends: A Thanksgiving Reunion Special? 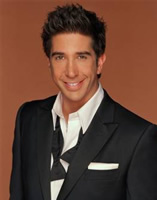 I think it is sad that David Schwimmer doesn’t want to do a reunion. It’s not like he has all that much going on that he could spend a couple of days endulging his fans for a hopefully great reunion. Well whatever he does I hope he will come to his senses and do the reunion. Personally, i think hes an *******(although he was my favourite cause i thought he was the funniest). I mean, look what friends made him, and look what he goes and says ” Ive moved on” WTF! IMO i think ‘Friends’ was and always will be THE GREATEST TV show to ever and u will never find a better show than it. I don’t think we will see better tv show than friends. cos when I watch them and how they live it just takes me into thier life. leave without watching friends and now I’m replaying it from the begining. so I can say I’m obsesst with friends . NBC gave him 10 good years, of pay, Fans, and RACHEL GREEN!!!! AND HE CAN’T DO 1 REUNION SHOW!!!! JERK!!!! Ross would say NO to a reunion of FRIENDS???? Well I am very sorry to hear that David. Friends fans everywhere would absolutely love to see a reunion take place. We all were sorry to see the show end. It was hands down the best show ever! You say it gave you the financial freedom to do what you wanted? That came from where? Lets not be an actor that just can’t be bothered with your fans trivial requests! We were there for you for 10 years and you can’t do a reunion show? Very disappointing David!! !